It happens not too often in these last years of the Berlin Film festival but it still happens. You see a film without any expectations and to have chosen to see just this very film is often accidental. Such “accidents” are during a festival often the most rewarding. That happened to me just last year when I saw a documentary in the Generation section called Loving Lorna by Annika and Jessica Karlsson. The few information I had from this film sounded interesting to me and I had no idea that it turned out to be one of the most beautiful films I saw last year. And this is still one of the very few advantages of film festivasl. 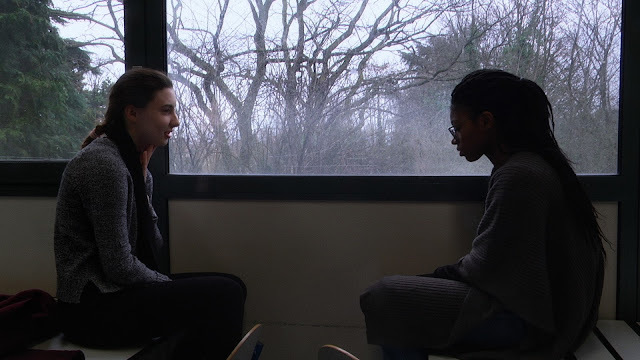 Premières Solitudes consists mostly on conversations between young students at the eleventh grade of a secondary school in Ivry sur Seine,one of these prosy suburbs of Paris. Two or three of them meet on a place they feel comfortable with and talk about their lives, their relationship to their parents, love and what they want to do in the future. Most of them are children of divorced parents. Some of them like a young woman born in Nigeria lives with a foster mother. The presence of the camera seems to increase the relaxed atmosphere. Each of the young protagonist feels free what to tell and how. The places where they meet are like niches, places at least one of them likes. One of the miracles in this film is that these conversations seem never forced. As sober and prosaic the film´s initiation point is, it develops later into a little universe of human life with all their stories. The presence of these young people leads a life of its own. I assume they do not just follow only the filmmaker´s concept, they also perform and it seems they retain the control about what they give away from their privacy and what not. Some very few shots display the landscape of this environment, small traces of nature in this mostly very boring suburb. From time to time the camera finds glimpse of beauty, engrossed places where some of the protagonists are seen often when they meet and talk. The spirit of security and freedom the film evokes might be fleeting and often in contrast to the awareness that these young people have hardly a chance to talk like that at home with their parents.These fragments of human life appear more and more like landscapes. Except some few moments when nobody speaks, one feels the presence of the camera. But mostly the spectator seems to forget it´s presence like the protagonists. zone where the spectator like the protagonists can move freely. How big the quantity of stories and information really is, I realized long after I have seen the film. The restraint formal concept of the film or even the illusion of the absence of any formal aspect is of course delusive. The film´s point of view avoids to impost itself as wiser than what it reveals. This point of view gets finally wiser through the experience it makes with this piece of world and as the film proceeds and as the result of experiences it learns permanently. The film beneficiates itself from moment to moment. It is almost like I have seen a film is arising in front of my eyes. The old problem of documentary which deals with real problems is that one wants to learn as much as possible from these people but at the same time there is the privacy of real people to protect. In Premières Solitudes, it seems the protagonists take this decision in their own hands.